HIV activists Elizabeth Fernandes (kneeling), Francisco Pinto and Suzeth de Morais are helping Angolans with the virus get the treatment and care they need to lead healthier lives. Luanda, Angola—An innovative approach to ensuring follow-up care and treatment of Angolans who test positive for HIV is giving women and families the hope and means to lead healthy lives and protect their children from the virus. In two provinces in Angola, Jhpiego has been working in partnership with the National AIDS Institute to strengthen the cascade of care: enabling more pregnant women to get tested for HIV during their first antenatal care visit; ensuring that those who test positive receive antiretrovirals (ARVs); promoting births at health facilities; and following up children exposed to HIV until they receive definitive results of their status. The President’s Emergency Plan for AIDS Relief, through the U.S. Agency for International Development, and UNICEF are supporting this intervention. Integral to the success of this initiative has been training nurses to prescribe ARVs and enlisting HIV-positive activists from Huambo and Luanda provinces to serve as client advocates, who can share their personal experiences and facilitate the care and treatment of fellow Angolans newly diagnosed. These activists bring real-life experience to their work. 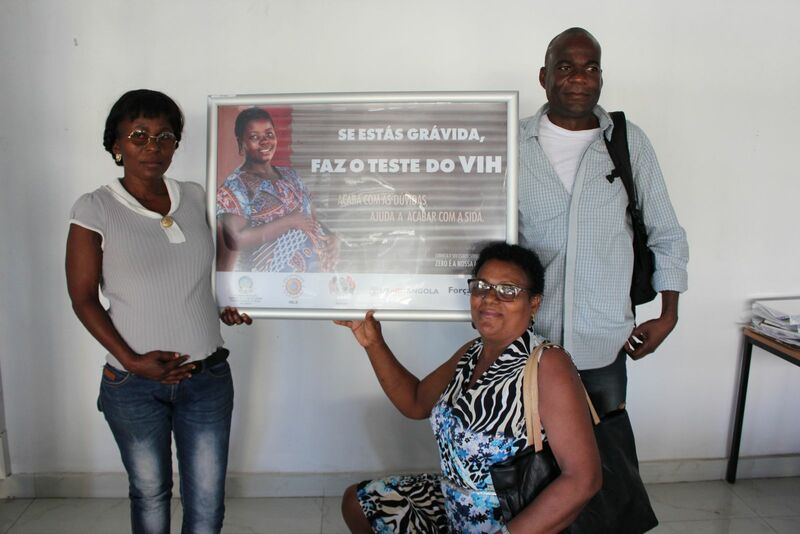 After years of battling discrimination and stigma, activists—such as Elizabeth Fernandes, 50, Francisco Pinto, 42, and Suzeth de Morais, 41, who learned of their HIV status over six years ago—are working in clinics and convincing pregnant women and their partners to get tested and counseled, and, if positive, enter treatment and protect their unborn children. The activists are engaged in the lives of their clients, often going beyond their daily routines to help women and families struggling to cope with their newly learned status. Below are a few examples of the determined efforts of these activists to keep families together, healthy and thriving. Early one morning, Elizabeth receives a phone call from a client, a 36-year-old pregnant woman. She has been beaten by her husband after revealing her HIV status and needs medical attention. Elizabeth travels to the woman’s home, takes her to the hospital and then escorts the woman home. There she finds the husband’s relatives threatening to sell the family house and toss her pregnant client out on the street. Steadfast and calm, Elizabeth appeals to the family and they back down. She explains that HIV is not a death sentence, that she has been living successfully with the virus for more than a decade. Considering her earnest appeal, the husband eventually admits that he too has HIV and has had several partners. He then agrees that these women, whom he refers to as his other wives, and his four children all should be tested. After counseling a pregnant woman on her HIV-positive result, Suzeth is asked to help the woman break the news to her husband. The client, 30, and a mother of two, is fearful of his reaction. Suzeth meets with the husband the following week, who tells her that he has been tested through the urging of his boss and, thankfully, his results were negative. Suzeth encourages him to retake the test with his wife, saying, “If he was negative, probably the new test will be negative, but if it was not, he could receive treatment.” The husband was tested and his results were negative. Suzeth gently explains that his wife is not as fortunate. Upset by this news, the husband worries aloud if he can live with an HIV-positive woman.